This year The Orianne Society participated in the 46th Claxton Rattlesnake and Wildlife Festival hosted by the Evans County Wildlife Club in Claxton, Georgia. This was the second year of the event being held as a festival rather than the historical Rattlesnake Roundup, and we were as happy to participate this year as we were the first year of the change! As most of you may remember, the initial move from a roundup to a festival was a tense one. There was much opposition from the community concerning fears that the festival would not generate as much attention as a roundup. This year proved again that those fears are unfounded as attendance increased yet again! Roughly 17,000 people entered the gates this year and enjoyed a weekend full of fun, including the opportunity to see snakes, turkeys, turtles, beauty queens, and catfish roping, not to mention enjoying the food which ranged from funnel cakes to gyros! I had a moment after the festival to sit down with Bruce Purcell, the president and mover and shaker of the Evans County Wildlife Club. Bruce was the one who initiated the move from a roundup to a festival and he stands by that decision after the attendance this year. Bruce shared with me that he felt making the move from a roundup to a festival that celebrates wildlife was a real feather in the cap of the Wildlife Club, and that providing a conservation message would bring a great deal to the table for the club. Although Bruce does not see himself as a conservationist or an animal activist, what he does see is that people need to use more common sense when dealing with wildlife. When the festival was a roundup, the decline in the number of snakes being brought in to the event showed that people weren’t as excited about collecting rattlesnakes from the wild anymore and that those that did collect were not able to find as many snakes as in the past. The move to a festival that promoted wildlife conservation culminated in all rattlesnakes going home at the end of the weekend rather than a one way ticket to a skin shop. This approach to educate and celebrate rattlesnakes not only elevates the event but assures a more family-friendly experience. As for us here at the Orianne Society, we had a great time again this year and were pleased to note a bit different vibe than last year. Rather than the standard line from visitors, “diamondbacks are a dime a dozen in these parts”, you heard a lot more “you sure don’t see those like you used to” – a sure sign that people are starting to realize the effects of long-term collection on local snake populations. And, of course, the non-venomous snakes that people can hold and experience are always a huge hit. All in all, I would say this year was a great success. The conservation groups showed up once again this year to support the festival. The Georgia Department of Natural Resources had a huge presence, as did our friends from the Gopher Tortoise Council, Edisto Island Serpentarium, and Zoo Atlanta. Also, there were some newcomers this year, including Jason Clark from Southeastern Reptile Expo who gave very colorful presentations and who, in our opinion would make a really great additional “pit master”. We look forward to participating in this festival again next year and would participate in any other roundups that transition to a more wildlife-friendly event. Is it easy for us to participate? 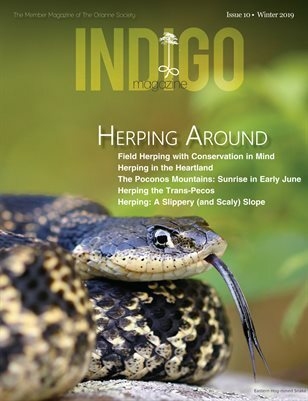 No, it is a tremendous amount of work caring for our rattlesnake population at the Orianne Center for Indigo Conservation all year to take to this one event. Is it costly for us? You bet it is. Feeding diamondbacks throughout the year, housing, veterinary care, the travel and transport to the festival, staff time – it certainly adds up. But is it worth it? Absolutely. The more we can educate the public about the value of snakes, the better off our ecosystems will be. The more Eastern Diamondbacks we can conserve by promoting a wildlife-friendly festival rather than a roundup, the better. We’ll keep doing it – every year. For those of you that showed up to support the festival – good for you and thank you! Keep coming, keep supporting the change, and keep doing your part for conservation. Any conservation group or individuals that are interested in participating next year shouldn’t hesitate to volunteer. It is a good time and it is accomplishing great things for snake conservation. We all talk about wanting to end rattlesnake roundups. Well this one ended, it is successful, and now we have to keep supporting the cause and hopefully other groups, such as Whigham and Opp will follow suit and make the transition to a more conservation and wildlife-focused event.